I hope you all had a great weekend and a great Monday! We had a fun, quiet weekend. Saturday is "Mom makes yummy breakfast" day. Eggs, toast, and bacon or sausage. It's tradition. :) It is so fun to start these traditions with our kiddos. Even though they are still little, we are becoming our own family unit and I LOVE it. The rest of the day Saturday, we ran errands and worked on some little projects around the house. Sunday we went to church and then "attempted" to go blueberry picking. We found this awesome blueberry patch not far from our house. It's a very low key, help yourself place, so I couldn't call to see when they would be ready. We went a couple years ago and I have a photo to document it, so I knew it was about the right time. Well, we all got our grubby clothes on (it was HOT) because the patch is rather overgrown and you end up with blueberry stains all over. The kids were all excited, I had huge ice filled water bottles ready, then we got there. There was no sign for pick your own blueberries :(. We checked out the patch and nope. They are far from ready still. I guess our cold spring really set them back this year. Oh well, we will try it again in a couple weeks! So back to the house we went and hung out watching the kids play in their kiddie pool. And we had a great time. Oh, how I love them! Ok, back to the sewing! 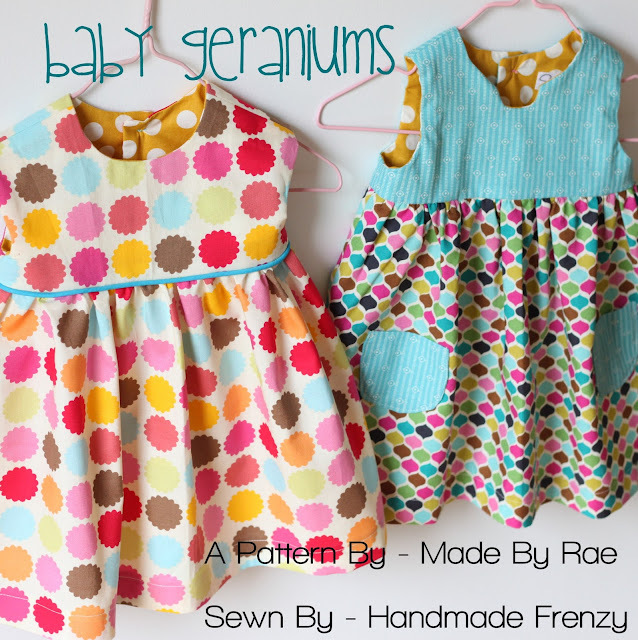 So if you've been around the sewing/crafting blogging world even just a little bit, you've probably seen or heard of the absolutely adorable Geranium Dress pattern by the lovely and talented Rae over at Made By Rae. This pattern has so many fun options and can be customized and personalized almost endlessly. It also comes in a wide range of sizes, so it will grow with your little girl (or friends' little girls). Definitely a good one to have in your stash! I've been longing to make one for my little miss and when two of my wonderful friends each had sweet little girlies, I knew it was time to get my hands on the pattern and whip up some dresses! Those little buttons on the back. Oh how I love them! It's hard to tell because there's not really anything to compare them to, but theses dresses are just so teeny tiny. I chose to make size 3-6 mo, since we all now how CRAZY fast newborns grow, and how there really are not that many times a newborn would wear a dress like this. And when they are THIS cute, we want them to wear them!! I love the bright happy print of this fabric. It reminds me of candy :) It's from Hobby Lobby. I know they have carried it for a long time, and I just bought this within the last month. I don't however know the name of it. For this little dress, I went with the basic round neckline, the little cap sleeves, and gathered skirt. I added the piping for a little extra oomph to an otherwise simple dress. The blue of the piping and buttons just makes the dress pop. For the second dress, I chose the cutout neckline and sleeveless option. I went with the gathered skirt again and decided to add the little pockets. I adore pockets! The bodice fabric is from my local Joann store. The skirt and lining fabric is from Hobby Lobby. There really is nothing I don't like about this pattern! The instructions are very clear, the dress comes together very nicely. I didn't have anything that I would have changed in the methods used. Love those cute little buttons! And those sweet little pockets! One more shot of the two of them together. I love how different they are, and it's from ONE pattern! In summary, this is surely a must have for your pattern collection!